Never Not Knitting: The Never Not Knitting Podcast : Episode 79 : The End of the Optimistic Knitter? 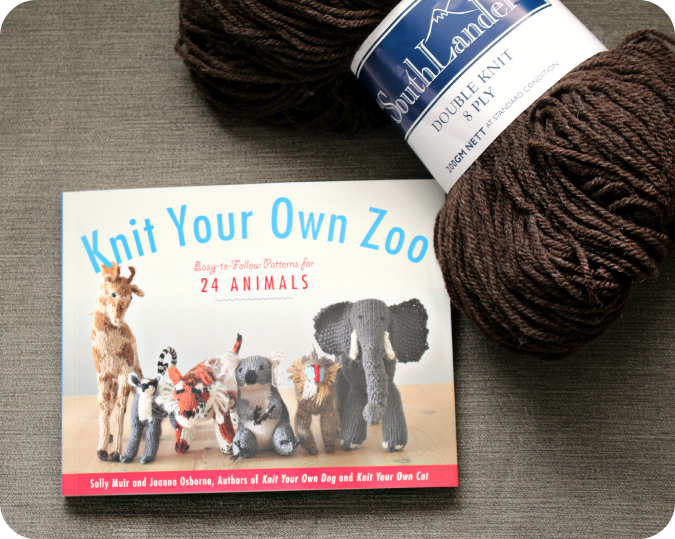 Enter to win this copy of Knit Your Own Zoo (provided by Black Dog and Leventhal Publishers) along with a skein of New Zealand Southlander yarn (provided by Skeinz) by leaving a comment under this post by March 15th. Please remember to include your contact information. Only one comment per person please! The winner will be announced on Episode 80. Don't forget to check out our website botanicalknits.com for more information or to place your order for the new book, Botanical Knits 2! Pre-orders will be open on March 3, 10:00 am PST. I borrowed this book from my local library and would love to own a copy! What a cute book! I love knitting toys and stuffies. Thanks as always for the chance to win - I'm ShadowAP on Rav. I would love to try this yarn. Love your podcast. My dad and I share a minor obsession with giraffes, so I would love to knit him one! Lovely book and yarn too. Would like to try those. So excited for BK2! This cute toy book would be great to have :) Skyhuntress on Ravelry. This is the first time I've listened, and I really enjoyed it! I would love to make animals for my boys. I'm ladydisdn on Ravelry. Knitted animals will always be beyond adorable and a little zoo even better! I've made a fox already, now to fill out the rest of the menagerie. I love making softies too. They are just so much fun.. I haven't seen this particular book but I have the book about dogs. The yarn looks lovely. Can't wait to preorder your new book. Congratulations. All the designs are wonderful. I can't wait for your new book!!! And thanks for the chance to win this one. Your new book sounds even better than the first! I love knitting toys! Thanks for the opportunity. I would love to put my face in that awesome skein of natural yarn! Ishton on Ravelry, Love the podcast! I would love to win this book! Thank you, KatarinaLL on ravelry. Oh, I'd love the zoo book. I want to knit all kinds of softies for Iain. Thank you! So cute, I'm just getting into knitting little animals for my 3 yr old. Would love to try these! such a sweet book!! I know my little one would adore some of these!! This would be awesome to knit animals for my niece and nephew! My Ravelry ID is PearlofthePacific. Who couldn't use their own zoo? I have been knitting on and off for about 8 years. Just this past week I met a gal at my Zumba class that was talking to a friend about knitting. Her inspiration encouraged me start listening to podcasts. During my search I came across Never Not Knitting and was instantly inspired. It is encouraging to hear that setbacks do occur while doing projects. Recently I heard about Stitch Midwest Conference in IL and I am excited to attend in August of this year. This will be my first Knitting Conference and I am very excited to experience the many workshops and to learn new skills. I am excited to be entering my first drawing for the book on the zoo toys. It was wonderful to meet you at Stitches West. Am looking forward to BK2. What a wonderful book! I dont crochet, so i am always julealous of the crochet softies that are around. I love these knit patterns and would use the heck out of this book! Thanks for the giveaway! Love this book -- and the yarn! thanks for the giveaway! The book seems really cute, but what I really want is to get my hands on that yarn. Looks yummy. What a cute book. I love all the little animals that can be made. Makes me wish I was still a child. Savannagal on Rav. The new Botanical Knits book sounds terrific! I love the idea of knitting a zoo, too. What a fun book. I just blocked Entagled Vines so am ready to cast on something new! I'm looking forward to the new botanical knits. The zoo looks so cute. Animals! I love knitting toys, and animals are always a win with me. I haven't been to the zoo in forever, mostly because I've moved away from where I grew up and I just don't know if I can find a place in my heart for a new zoo. Also my dog would be horribly jealous if I saw the elephants without him! I'm on Ravelry as k8sx. That looks like an adorable book! How cute! I love animals and I love knitting; I'm normally not that into knit toys, but I can see myself making an exception here! We love your podcast and your stories are so cute! Love all the new ideas for your book! I'm working on some nature patterns myself. Dragoness3890 on ravelry. I just found your podcast and love knitting toys... this would be great! Thanks for the chance! Who wouldn't want to have their own zoo! These would be great fun to make and to give! Thanks. Listening to your podcast brings a vast amount of info on things that I would never get to hear about. Thanks for all your hard work and keep them coming. The critters look so cute. I just love the design of the fern beret. I hope to get to it at some point. These animals are so cute, and the yarn sounds intriguing, pick me, pick me! I visited skeiNZ when i was in napier last year and it's an awesome shop - they actually have a huge mill at the back of the shop and the ladies were so nice - they gave me some sample yarn to take back to Australia with me!! Wow! Those animals are so cute! I am Psychorat on ravelry. By the way, I can't wait for your new Book to be released. The designs are just gorgeous. The book and yarn look amazing!! I am a new listener as well as a relatively new knitter. I would love to be entered in this giveaway. Just found your podcast what took me so long? I love knitting toys for DS in between your addictive sweater patterns. Better put my name on the list for BK2 after this podcast! Sprig is otn currently and I have stash for the hoodie! Thanks for everything! This looks like a super-cool book. I've been on a toy knitting kick for my daughter lately, and I would *love* to win a copy of this! I haven't tried knitting toys yet, but I'm sure my kiddos would love them. My sister is using giraffes as her theme for her next baby's room. That one looks perfect! Thanks for sharing your love of knitting! The kangaroo sounds beyond adorable! Also, can't wait for BK2. I've knit 2 hats from the first one so far! I have just pre-ordered BT2,can;t wait to get started on those gorgeous patterns. I already have Knit your own dog and knit your own cat, would love to add the Zoo to my collection! The animals in this book are so cute I would love to get a copy so I can knit them for my daughters. The giraffe is my favorite. I have a 5 1/2 year old daughter, and she would love for me to knit her a zoo! I thus really like to have a copy of the book. Just preordered Botanical Knits 2 and fell in love with your blog! I've made a few sock animals but I've never tried knitting one... This book is adorable! I'm jusan003 on Ravelry. One of my favourite toys as a child was a koala tea cosie. I would love to knit a proper koala. I'm am looking forward to botanical knits 2, I am yet to knit from 1 but I am sewing the buttons on my gnarled oak tonight, my best fitting cardigan ever! I have grandchildren who would love these toys! That looks like a delightful book. I love knitting toys and would love to try that yarn. Rav ID sockmonkey628. Wonderful episode as always. Thank you for making my commute a pleasant time. I would love to win this book and yarn. So much fun! I am Knitgen on Ravelry. I am really enjoying your podcast, I am currently working my way through your back catalogue. I am really looking forward to Botanical Knits 2 being published. My friend and I were plotting over which items we will start first. I am Hayeli on Ravelry. (this is my 3rd attempt at posting a comment, I kept forgetting to put thing – like my name) in the comments. This book and toys sound adorable, thanks for the opportunity to win a copy. Love your podcast! Thanks for all the hard work you put into it! this book looks like a lot of fun. That book looks so cute! Toys are so fun to knit. Such cute, more realistic knitted toys! I can't wait to look through the book. Now that I have a nephew I'm looking forward to knitting toys like these. Hope I win and can start soon! Great episode as always, and what a handsome looking skein! I´ve croched many little animals, but I would love to learn to knit some. How cool is this book! I love how unique and fun the animal designs are. Thanks for sharing the patterns in your new book, I enjoy following along, hearing and seeing the patterns as you talk about them. What a fun book! My little girls would love the animals! Thank you! grandymom on rav. I too love a knitted toy. There are quite a few in here I haven't ever made yet. The kangaroo sounds so cute! With a new granddaughter this would be wonderful to win. I love knitted animals and would love the opportunity to add to my menagerie. And thank you for the preview of all the botanical knits patterns. I think I want to knit them all. I just listened to your podcast for the first time. Very entertaining while winding yarn. Thanks for the opportunity for the book and yarn. I'm off to check out your book(s). What a yarn! Would love to try it! Thanks for all the work you put into the podcast, you spread so much joy! I just pre-ordered Botanical Knits 2, along with the first Botanical Knits AND a copy of Annie and the Swiss Cheese Scarf. I LOVE LOVE LOVE the ebook of BK2 and have already added 8 of the projects to my queue! I enjoy listening to your podcast on my drive to work. Looking forward to getting your new book. The designs sound and look great. I made my first softie last month for a new baby in the family and loved knitting it. Looks like a charming book. Love Botanicals knits I&II have my Sprig almost done! SOOO Adorable! I have people in my live that would love these little knitted animals!! Botanical Knits 2 Pattern Preview!